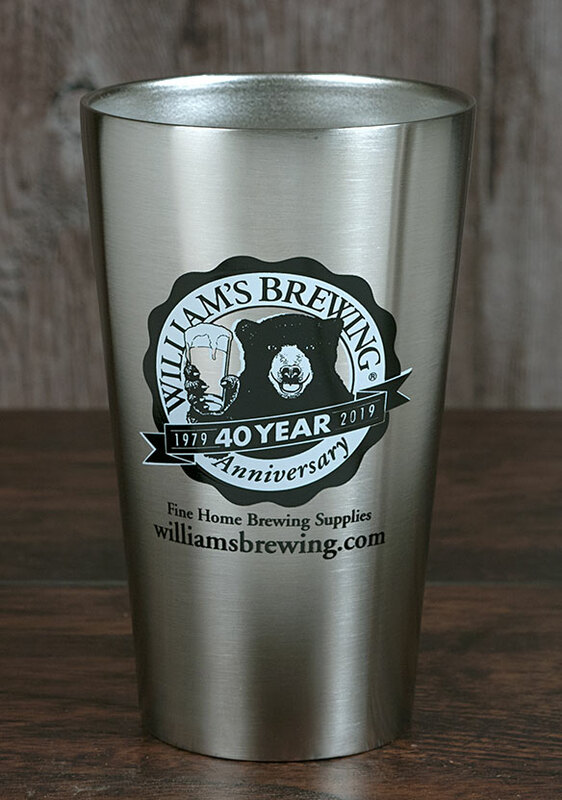 This limited edition 40th anniversary stainless steel 16 ounce pint style glass features double wall stainless construction, so it insulates much better than glass. It insulates so well a coaster is not generally needed when placing this glass full of cold beer onto a wood table (although this may vary in extremely humid climates, remember, we are in California). 6" tall, dishwasher safe. I got these last year as a freebie for buying something else. I just tossed them in the recycle bin. They are not very smooth inside and thus have a lot of nucleation sites. I don't use them all that often but  I am tired of pours going completely to foam. I probably could have polished them smooth but I have other options for drinkware. I received these as part of the bearpair special and the exceeded my expectations! Cold fresh tasting beer from a stainless steel pint glass is refreshing and so addicting. I keep going back for more home brew! Thanks William!!! from Stafford Springs Very Nice! I was pleasantly surprised when I opened the package to find these very nicely made stainless glasses. There are no seams on these at all! No places for anything to build up and cause off flavors. The outside is a nice brushed finish and the inside is slightly matte, not polished. They work very well, and at least as well as another brand I had purchased for almost $20 each. It is not super heavy so you don't have to do a bunch of curls to get ready for this thing. Very finely crafted, no sharp edges or burrs. Didn't sweat, but I live in NM so my glassware doesn't sweat either. Overall you can't find insulated SS beer holders at any other homebrew supply so revel in the uniqueness. This thing is very sturdy it doesn't sweat and keeps home brew colder longer. And did i mention that's it way cool? No, it does not have a lid. Why does it say not dishwasher safe? My yeti is and looks pretty similar. Is it only that the logo might wash off? I am going to place in dishwasher regardless! Otherwise a nice light cup. It is dishwasher safe! We will correct this error.